↑ مجار دیلی and ایتالیا دیلی are co-official in some municipalities. 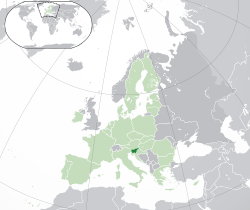 ↑ Slovenian tolar prior to 2007. ↑ Also .eu, shared with other اوروپا بیرلیگی member states. ↑ PisRS. Pisrs.si. یوْخلانیلیب2 June 2012. ↑ Božič, Dragan (3 November 2010). "Katero kitico č'mo kot himno zapet'" [Which Stanza Should We As the Anthem Sing?] (in Slovenian). ISSN 1854-6544. Retrieved 14 February 2011. ↑ Škrinjar, Klara (3 September 2012). "Zdravljica v političnem in pravnem primežu" [Zdravljica in the Political and Legal Vice]. Delo.si (in Slovenian). ↑ Census 2002: 7. Population by ethnic affiliation, Slovenia, Census 1953, 1961, 1971, 1981, 1991 and 2002. Statistical Office of the Republic of Slovenia. یوْخلانیلیب2 February 2011. ↑ Površina ozemlja in pokrovnost tal, določena planimetrično, 2005 (Slovenian, English). Statistical Office of the Republic of Slovenia. یوْخلانیلیب2 February 2011. ↑ ۷٫۰ ۷٫۱ Population. Statistical Office of the Republic of Slovenia. یوْخلانیلیب2018-10-02. ↑ Error on call to Şablon:cite web: Parameters url and title must be specified. IMF (20 October 2019). ↑ ۹٫۰ ۹٫۱ ۹٫۲ Error on call to Şablon:cite web: Parameters url and title must be specified. IMF (20 October 2019). ↑ Gini coefficient of equivalised disposable income (source: SILC). Eurostat Data Explorer. یوْخلانیلیب2017-08-16. ↑ Key to HDI countries and ranks, 2015 (PDF). یوْخلانیلیب2017-08-03. بۇ صفحه‌‌ سوْن دفعه ‏۲۳ فوریه ۲۰۱۹، ‏۱۹:۳۶ تاریخینده دَییشدیریلمیشدیر.